While a forklift is an indispensable piece of warehouse equipment, it can be helpful to think of it as akin to a seesaw, at least when you’re thinking about how it can be affected by different loads. But unlike a seesaw, you’re looking to keep your end of the forklift firmly planted. Suddenly launching upward in your seat is a far more unnerving experience behind the wheel of a forklift than it ever was on the playground. The fulcrum of the forklift is the front axle. The goal at all times is to counterbalance the weight in front of that axle—i.e., the forks—with the weight behind the axle—i.e. where you’re sitting. Forklift manufacturers take care to make this balancing act as straightforward as possible in order to avoid hazards. 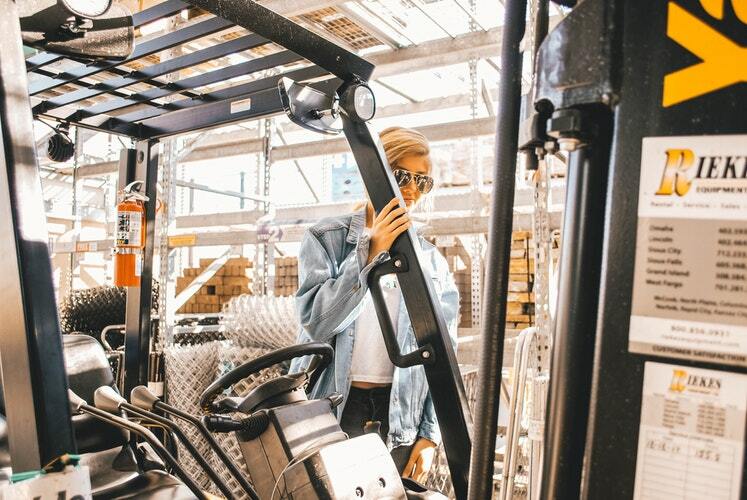 Knowing what information you need to check, and some best practices for loading and operating your forklift will help you stay grounded. The back end of your forklift, behind the front axle, is already a good deal heavier than the mast and forks on the front-end. But when you go to lift your load, things can change. Every forklift comes complete with a data plate from the manufacturer. This data plate specifies the maximum load capacity at a specific load center. The load center is a measure of the distance from the base of the forks—where they connect with the mast—to the center of gravity of the load you’re looking to pick up and carry. Common load centers include 24, 36, and 48 inches. The shorter the load center, the more weight you can carry before tipping over. One important note here is that load center capacities differ for different forklift attachments. If you plan to install an attachment, be sure to notify the manufacturer, who will send over a new data plate with adjusted load center capacities. Heading to your local OEM dealership will help you get this information faster. If you’re in or around St. Charles, MO, Benco Industrial Equipment is proud to serve as your local authorized Hyundai forklift dealer. Keeping your forklift firmly grounded is more than just mathematics. Adhering to best practices will help you avoid potential tipping hazards. In large part, this comes down to properly positioning the forks before lifting the load. To start, position the forks as wide as possible to fit the load. This will help to distribute the weight evenly and keep it from falling off of one side or another. Second, be sure to level the forks themselves before inserting them into the pallet holding the load. Third, be sure that the forks are the same distance from the center stringer of the pallet, the beam that runs through the center. This too will help to keep the load from tipping to the left or right. Ensure that pallets are in good condition before lifting them. Also make sure that the load is evenly distributed across the pallet and properly secured. If a load shifts suddenly, either from a compromised pallet giving way or a load shifting unexpectedly, the load center shifts, and you could be heading for an unwanted trip on the seesaw. Contact Benco Industrial Equipment today at 636-486-1693 or 888-946-8236 for a forklift dealer you can count on in the St. Louis Metro Area.